Have you ever just wanted to walk away? Have you ever sat down, closed your eyes and disappeared? and uncover your true self? and you can barely breathe for longing? but you’re too afraid to leave. The room was filled with balloons and the floor was carpeted with bubble wrap. The balloons looked like normal balloons but seemed to bob strangely in the air, as if filled with something. A small child is huddled in the corner of the room, fearfully facing the only exit to the room; a large red door. The door begins slowly begins to open, creaking loudly in the process but no one but the small boy seems to notice. The door then shuts and the balloons and dancing guests part as an invisible force makes it’s way towards the young boy, the bubble wrap crackling with each step. The small boy whimpers and his lips can be seen mouthing “Stay strong my boy, Stay strong my boy”. His lips quiver as he keeps muttering the mantra under his breath, eyes fastened fearfully on the advancing force. Then clenching his fist, he resolutely faces the creature as if determined to face whatever challenge comes his way. Suddenly the balloons start exploding violently, spewing puffs of color into the room. POP! POP! POP! Each pop shattering the silence like a shotgun blast. The colored fog that billows from the balloons eats up the air in the room and transforms it into a mystical shadow land, the chairs, tables and people acquiring almost ethereal qualities as they are consumed by the fog. In the fog that is created, a silhouette can be seen. A blank area where the fog can con penetrate, and it is advancing on the young child who is now standing, fist clenched and face scrunched in concentration. The crowd, oblivious to the action bursts into song “Happy Birthday to you, Happy Birthday to you! Happy Birthday dear Kevin…” The happy joyous song striking a sour chord, each burst of merriment underscoring the young child’s advancing death. The irony of a celebration of life on the eve of his death seemed to register on the young child’s mind. He glances fearfully at the incoming menace and then with a shout charges into the mist hoping to get lost in the crowd and make his escape through the door. He moves faster than he has ever moved before, running as if he has gained wings, but before he can even reach the edge of the crowd the shadow is upon him. He can feel the cold clammy hands gripping his neck and drawing him back as if by sheer force of will. He struggles, his legs pistoning and arms flailing but it’s as if the very air is against him and he is drawn back inexorably to his doom. His flailing starts to slow and his body begins to grow limp. There seems to be no escape. Then from the resounding silence that had come after the balloon explosion and songs, a voice booms out, filling the room with sound. The boy, moving as if through thick jello reaches for his chest where the whistle hangs. His hand rests on his heart for a moment and he can feel his heart trying to rips it’s way out of his chest. Grabbing the whistle and struggling to bring it to his lips even as the invisible hand crushes is throat, he blows with all the air left in him. The whistle’s piercing scream fills the air and the room is consumed by it. Time stops and the room is silent it the midst of the sound, each person frozen as they were. Then the aura of death, darkness and confusion is shattered and so is the room and everything else in it. Still screaming, the echo of the whistle still ringing in his head, Kevin lurches upright, hitting his head on the top bunk. Panicked he looks around, eyes darting from place to place, thoughts running rampart in his head like stampeding buffalo. Where am I? What’s going on? Who…? 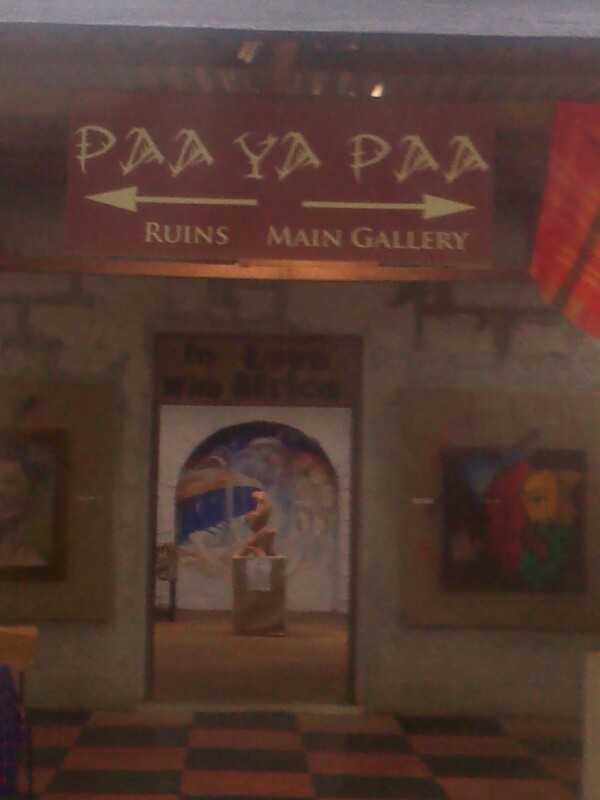 I went to a small rustic art museum in Kenya with a friend and I was simply delighted. It was a bit out of the way, just a small house with some really scenic vegetation surrounding it. The director is a delightful old man whose love of art and the African culture was very evident. It was called Paa Yaa Paa. I intend to do a poem for a few of these pieces. If you are interested in me doing a poem on a particular piece or if you are inspired to do one yourself please post on the comment and I will post it so everyone can see. If you are ever in Kenya stop by and experience this Paa Yaa Paa first hand. a dream, a hope, a regret. The creator of the work.